Figure 2.22. 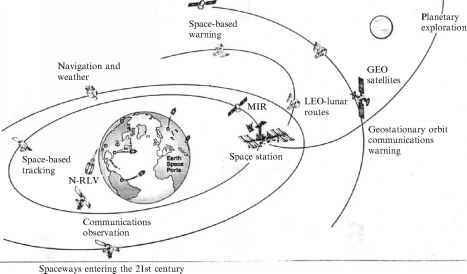 Our current space infrastructure, but without MIR is limited to specific LEO and GSO without significant intra-orbit operations. Hubble is in the space-based warning orbit, and is not shown. Figure 2.23. 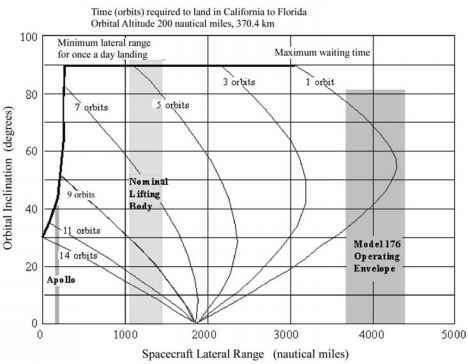 One US look to the future space infrastructure that fully utilizes the space potential by Dr William Gaubatz when director of the McDonnell Douglas Astronautics Delta Clipper Program, circa 1999.
can of course readily meet the military and commercial need that is suited to expendable launcher. Until a sustained use launch system is operational, the payloads that warrant a high launch rate system will remain the subject of design studies only. In other words, without the railroad there will be no railroad-sized payloads for Conestoga wagons. 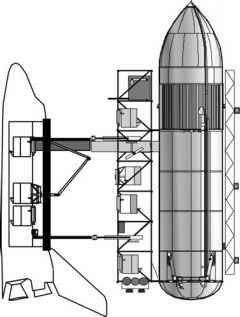 Perhaps if the Space Shuttle main propellant tank was slightly modified to permit its use as a space structure, like the Saturn S-IVB, an infrastructure might begin to build [Taylor, 2000]. However the Shuttle main tank is intentionally not permitted to enter Earth orbit and is deliberately crashed into the ocean. Figure 2.24. Waiting time is costly for commercial space operations. provide a system to launch and control missions to the Moon, planets and deep space. The Power Station Warehouse provides hardware for the power satellites in Geo-Earth Orbit, that, coupled with an Orbital Servicing Vehicle, can maintain this and other space resources. 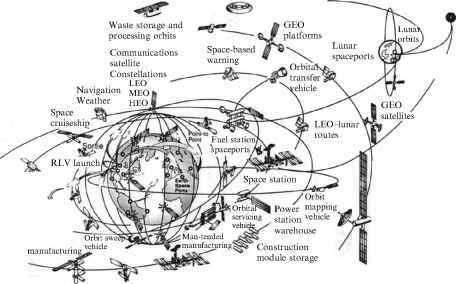 As in the USSR plan, there are lunar spaceports and lunar orbiting satellites. There are also space deployment and retrieval vehicles as well as a waste storage and processing facility in high orbit. So, Figure 2.23 provides a very comprehensive projection of future space if a suitable scheduled, frequent, sustained transportation and heavy-lift capability is available. That is what is needed to plan for the future, not the current status quo. Table 2.1. Return from orbit performance is configuration-dependent.